There are two specters haunting progressives as we near the endgame of this year’s health care reform debate. The first, of course, is the sad precedent of the Clinton effort. But the second is a success story, cited often in invidious comparison to Obama: the ghost of Lyndon Baines Johnson’s epochal legislative blitz of 1964-65, which produced the Civil Rights Act, the Voting Rights Act, Medicare, and Medicaid. 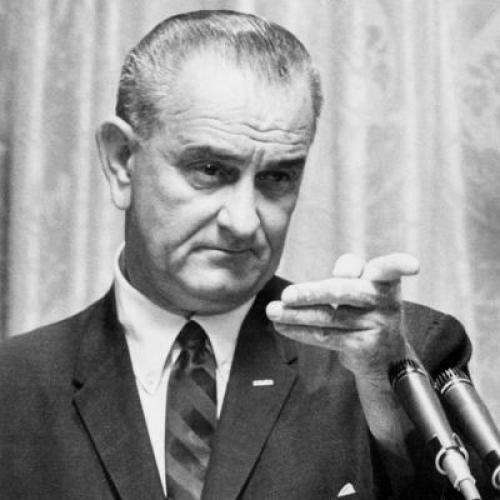 Obama is no LBJ … Given the reflexive Republican biting of Obama's extended hand, perhaps the president should have dispensed from the start with any serious effort to find accommodation with the GOP. … Instead of wasting energy on trying to persuade Republicans, it could have worked over dissenting Democrats in the Senate, and had a better shot at jamming the public option through. Schaller thus invokes the myth that LBJ, a famously truculent and manipulative SOB, when given a similar gift of initial public support and a big Democratic congressional majorities (particularly after the 1964 landslide), didn’t screw around with “bipartisanship” or compromises but instead bent Congress, including the inherently change-averse Senate, to his progressive will. Woe onto us that Barack Obama, the professorial amateur with a fatal addiction to bipartisanship and compromise, cannot be more like LBJ! The problem with this argument is that real LBJ wasn’t really that partisan legislative steamroller who announced what he wanted and got it. The Civil Rights Act of 1964 and the Voting Rights Act of 1965 accomplished, lest we forget, basic citizenship guarantees that took 88 years to enact after the end of Reconstruction. It took a martyred president and a vast array of contemporary and heavily publicized outrages against African-Americans to give these bills the political momentum they needed. And far from being the fruit of aggressive partisanship, the big civil rights laws represented a bipartisan and trans-ideological consensus outside the South to impose national values on that rebellious region. Yes, LBJ’s leadership (in tandem with congressional leaders like Hubert Humphrey) was essential to the enactment of the civil rights laws over southern Senate filibusters. But according to Caro, LBJ’s true “mastery of the Senate” was best displayed on behalf of the Civil Rights Act of 1957, which accomplished virtually nothing for African-Americans other than the establishment of a precedent for future action. As for Medicare and Medicaid, the idea that LBJ came up with a bold set of proposals and ram-rodded them through Congress is wrong by all sorts of measurements. It’s important to understand that however important these health care entitlements became, they were at the time clearly major compromises from the progressive commitment, first articulated by Harry Truman, to enact national health insurance. Medicare, obviously, was offered only to retirees, not all Americans--a distinction that is cherished as a matter of principle by those Medicare beneficiaries who today oppose universal health coverage. Medicaid was even more of a compromise, eschewing national health coverage for a crazy quilt system in which the states would largely determine eligibility and benefit levels, with coverage generally limited to low-income families with children. Medicare and Medicaid also did not spring fully formed from LBJ’s head or his White House, and weren't enacted via royal disdain for Congress and the petty fiefdoms of the committee system. Federal health insurance for retirees was narrowly defeated in the Senate in 1960 and in 1962. It finally passed the Senate in 1964, only to succumb in the House when Democratic Ways & Means Chairman Wilbur Mills refused to support it. It was finally enacted in 1965, but only after Mills shaped the legislation, and also added Medicaid, intended as a sop to Republicans and the AMA, which had long proposed health care subsidies for low-income families as an alternative to national health insurance. So the myth of LBJ as the driven president demanding and securing progressive legislation against the grain of party, congressional prerogatives, and even public opinion, is an exaggeration, to put it mildly. LBJ showed great courage and resolution on civil rights, but he was riding almost a century of momentum, and he certainly didn’t reject bipartisanship in his effort to get the job done. The landmark health care initiatives of Medicare and Medicaid were “betrayals” of the long-established progressive goal of national health insurance--certainly far more so than, say, the substitution of a health care cooperatives for a “public option” in a system of universal health coverage. Team Obama faces a crucible this autumn in trying to get health reform enacted, and the president’s legacy will be greatly affected by success or failure. But while Lyndon Johnson may provide inspiration in the small ball of legislative sausage-making or even the big lift of public persuasion, Barack Obama doesn’t really need to look over his shoulder at the big Texan’s shade.